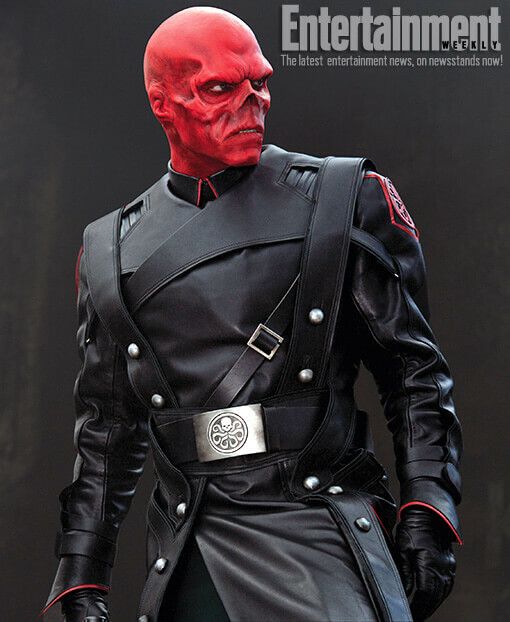 Entertainment Weekly reveals Hugo Weaving as the Red Skull in the upcoming Captain America film. Looks awesome! I heard we will be seeing a full trailer by the end of the month, so here is hoping! Captain America: The First Avenger stars Chis Evans as Steve Rogers/Captain America and Hugo Weaving as Johann Schmidt/The Red Skull. After being deemed unfit for military service, Steve Rogers volunteers for a top secret research project that turns him into Captain America, a superhero dedicated to defending America’s ideals. The film releases on July 22nd, 2011 and is directed by Joe Johnston. My only problem with this is the Hydra insignias. Um…pretty sure Red Skull is a NAZI!!! The whole Hydra play-up is so the movie can play in Germany A-OK. I hate when Hollywood re-writes and covers up history.